The world famous Fantasy Fest makes its annual return to Key West this October with the theme ‘Oh… the games we play!’ – a celebration of playing games. Here’s our Top Eight things to do at Fantasy Fest 2018! 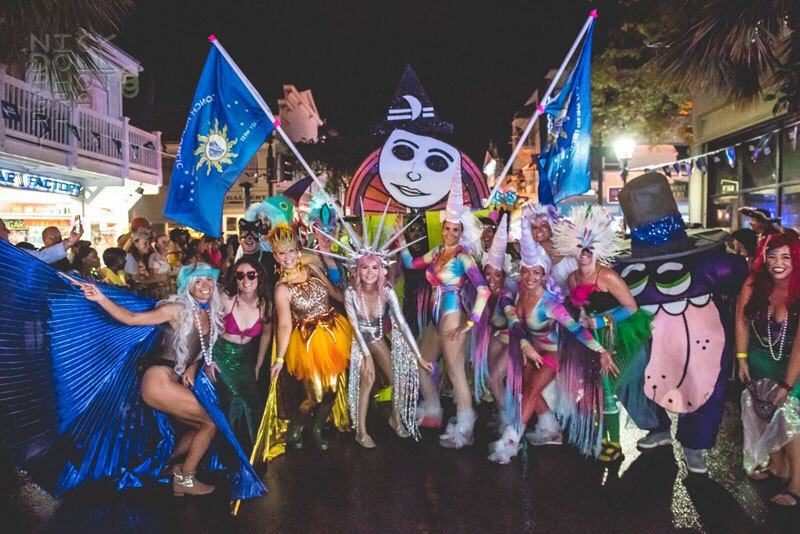 Fantasy Fest is a no-holds-barred, 10-day adults only party with dancing, drinking and plenty of loving in the island paradise of Key West. Everyone is welcome regardless of age, gender, race and orientation. It’s a fantasy, so treat it that way! Get down to the world famous Island House Resort for one of their special pool parties with plenty of fun, naked men and bubbly! Join the crowd as they parade through Old Town with music and noisemakers! Join 70,000 exuberant partygoers as this year’s Bud Light Fantasy Fest parade rolls down Duval Street featuring glittering floats, spectacular costumes and dazzling dancing groups! For the 9th Annual TUTU Party – they will be celebrating the glory of the TuTu and all of its wonderment! No Tutu, No Entry! This exuberant street party showcases island arts and crafts, music and food in the heart of Key West’s historic Bahama Village neighborhood. Rise from the dead and join your newly awakened zombies as they gather at Zombieland in Fort East Martello to get their blood flowing and bodies painted. Then hop on your bike and join the thousands of costumed zombies at 6pm when the zombie invasion heads down US1 to Duval Street for the Zombiefest in Downtown Key West. As the saying goes, “It ain’t over ‘til the fat lady sings.” Everyone will be at La Te Da from 4pm to 8pm for the last official event of Fantasy Fest 2018. For the full schedule and more details, visit the Official Fantasy Fest Website. The men-only Island House Key West has been called “The Best Gay Resort in the World” by a number of national and international gay publications. Imagine a five-star resort on a smaller scale, with just men for guests and staff. Island House offers the same amenities as a hotel, like feather beds and free WiFi. Have every need met as 37 men take care of just 39 rooms, you’ll feel pampered by those who understand you the most. Island House also all the resort facilities you would expect, including award winning restaurant, bar and health club. Alexander’s Guesthouse is a lovingly restored Key West Conch house built in 1902, boasting beautiful, original pine floors and stately windows. It is LGBT owned and run, and welcomes the whole LGBT community and their friends. Decorated with a tropical elegance, a homey atmosphere is thoughtfully created. Alexander’s is a retreat for the soul… comfortable beds with crisp white linens, a pool and jacuzzi to melt cares away, delicious breakfasts to rejuvenate with and a friendly Happy Hour where guests are invited to mix and mingle with complimentary cocktails. The Magic Is Back – Enjoy A Mary Poppins Experience in London!